Will The Baltic Dry Index Lead The Market Higher? The Baltic Dry Index is a leading economic indicator which can trace its lineage back to the Virginia and Baltick Coffeehouse in London in 1744, where insurers, shippers, brokers, and clients would gather to haggle over rates. It is released daily by the Baltic Exchange and is an amalgamation of three separate sub-indices, of different ship sizes: Capesize, Supramax and Panamax. The financial crisis and the collapse of international trade caused the Baltic Dry Index to fall harder than it has ever and to reach levels which were perilously close to its all time low reached in 1986 (554 points). The Capesize market was especially hard hit, with rates falling 99% from their highs reached in June 2008. 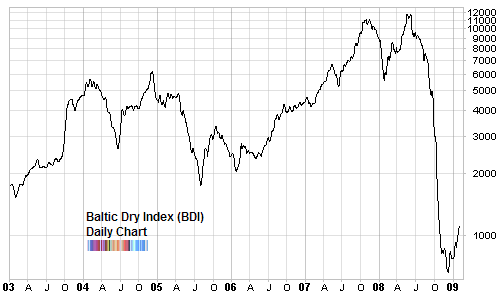 In the previous bear market, the Baltic Dry Index started to recover very early, at the start of 2002. 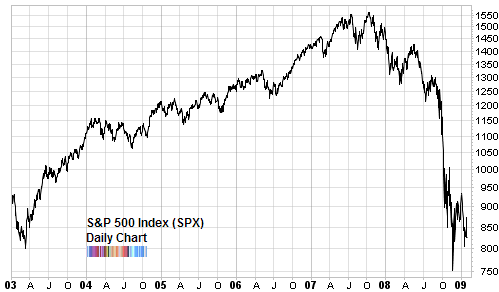 And by the beginning of 2003, it was well on its way, hitting new 52 week highs, well before the S&P 500 Index hit similarly new highs. Right now, the S&P 500 Index continues to be weak but the Baltic Dry Index has made higher highs and seems to be powering ahead, having risen 65% from its low. Will the Baltic Dry Index lead us out of this bear market also? What kind of index, EFT that track the Baltic index an average investor can buy? SEA is an ETF that tracks the Delta Global Shipping Index and looks to have a decent correlation to the BDIY (history only back to 8/25/08). “Chinese New Year is the likely explanation, according to the chief executive of the company that runs the gauge of shipping costs. Jeremy Penn, chief executive of the Baltic Exchange, said the index’s recent firming resulted from a rush of orders for materials like iron ore and steel ahead of the week-long holiday last week. He said while this increase can not be ignored, it should be seen in context of the larger losses the index has suffered the last 12 months. Penn said it will take a week or two for the Chinese New Year-effect to play itself out, but he wouldn’t say whether that means the index would continue its climb or settle down. As much as I’d like to see the Chinese dragon belch a little fire here, there are too many incidental issues like a pop in the BDI, that are not **necessarily** real. If you follow China at all ( I suggest Michael Pettis’s blog “China Financial Markets), you’ll know that Chinese officials normally aren’t so blunt about their country’s future prospects. They tend to couch their pronouncements in encouraging terms. When an official tells the world that things don;t look too good this year, where’s the driving force for the BDI? Feb. 2 (Bloomberg) — Fortescue Metals Group Ltd., Australia’s third-biggest iron ore producer, gained the most in almost two months in Sydney trading after forecasting second- half shipments will rise as steelmakers’ demand recovers. Fortescue rose 10 percent, the most since Dec. 10, to A$1.95. The Perth-based company may ship 17.6 million metric tons of iron ore in the six months to June 30, after exports in December quarter totaled 6.3 million tons, it said Jan. 30. The iron ore market, which slumped as a global recession forced steelmakers to cut output, may have bottomed as Chinese demand recovers, Fortescue said last week. China, the world’s largest buyer of the steelmaking ingredient imported 6.2 percent more in December than November, according to the nation’s customs. Hi Babak, nice post on the Baltic Dry Index. I also believe that many of the shipping stocks are leading indicators to the indices, they are definitely leaders rather than laggards. I was very surprise when Seaspan didn’t cut their dividend (like many of the other shippers did, for example Dry ships, Diana shipping, Eagle Bulk shipping etc). I believe SSW went ex-div’s on FEB 2nd, if they can keep that dividend going its a decent buy. 0.475cent div on a 10$ stock. The problem is the difference between correlation and causality. You and I both may have a flu, we are correlated, but you get it because did not protected last night after the game, and I get it in my house because somebody in my family. The only thing i can think of is the forward curve of the crude. A thinner spread between spot and next month might have some background for buying oil, which is the commodity more away of the 200ma. some calls might bring some profit.